An early start saw me leaving Gaucin at 6:30am it was a bit misty but a clear sky led to a lovely sunrise over the mountains. I drove to Ronda and then onto Sevilla and arrived in good time to collect James from his hotel in the centre of the city. Hundreds of swifts swirled around the high rise apt. blocks whilst, Spotless Starlings, Jackdaws and Monk Parakeets dashed about in the trees and parks. We arrived near Donana at 10am and began our birding day at the Botanic Gardens near Aznalcazar,unfortunately there was a team of Gardeners strimming the lawns so it was very noisy. We walked around for about an hour seeing Spotted Flycatchers, both Barn and Red-rumped Swallows, Greenfinches, Goldfinches, Serins and a few common garden birds. Common Nightingales sang from all around us, also Cetti's Warbler and Common Cuckoo added their voices. We had brief glimpses of both Melodious and Olivaceous Warblers, a Great Spotted Woodpecker drummed in the distance and a Common Kingfisher sat nicely for us. Moving on we soon realised that we had chosen the 'EL ROCIO festival weekend' to be in Donana, not a good idea, the roads were jam packed with dozens of carriages, or tractors towing carriages heading for the festival site. Many assembly points were dotted around the edge of Donana where these horse-drawn onate carriages and their accompanying folk, dressed in traditional costume, were gathering and preparing for the drive to El Rocio. Many birding sites were out of bounds so we had to make do with the best we could find, the Coredor de Verde was packed so we avoided it and went first to Dehesa de Pilas where a square plantation of Eucalyptus trees held a huge colony of Spanish Sparrows. Along the way we saw Crested Lark, Black Kite, Zitting Cisticola and lots of Finches. 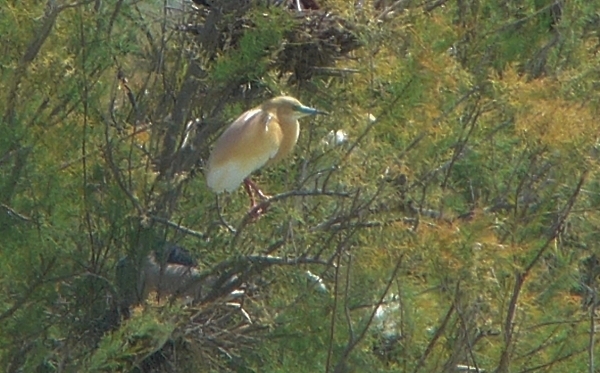 At the Dehesa we watched the Spanish Sparrows and also European Bee-eaters, Booted Eagles and lots of White Storks. Next we visited the large reservoir at Dehesa de Abajo which was packed full of birds, along the way we added Cattle Egret, Little Egret and Black-winged Stilts to the list. Hundreds of Greater Flamingos covered the reservoir with lots of Common Pochard, Gadwall, Great-crested, Little and Black-necked Grebes. Great Reed Warblers sang from the reeds and Purple Swamphens gave their strange call too. 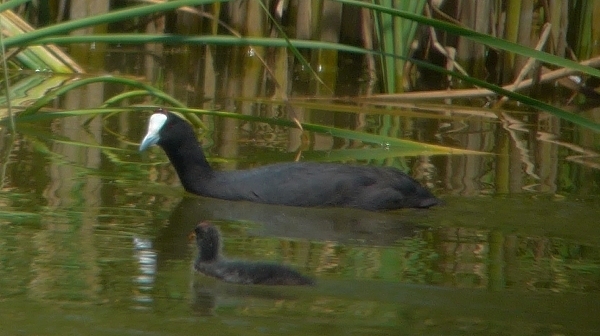 At the northern corner of the reservoir we found a family party of Red-knobbed Coots, it was so nice to see that they had bred even though they had only one chick. By now it was getting hot and we were hungary so we stopped at a venta for lunch and a cold drink, then we drove deep into the northern marshes to visit the Jose Valverde Centre some 30km along dirt tracks. We spent ages getting there making many stops to look at new species. James had to photograph every bird he saw, he got some great shots of Short-toed Eagle, Crested and Short-toed Larks, Little Owl, Bee-eater and some reasonable shots of Grey Heron, Purple Heron, Eurasian Spoonbill, Lesser Kestrel, Whiskered Tern, Yellow Wagtail, Corn Bunting and many more. The Jose centre was closed! 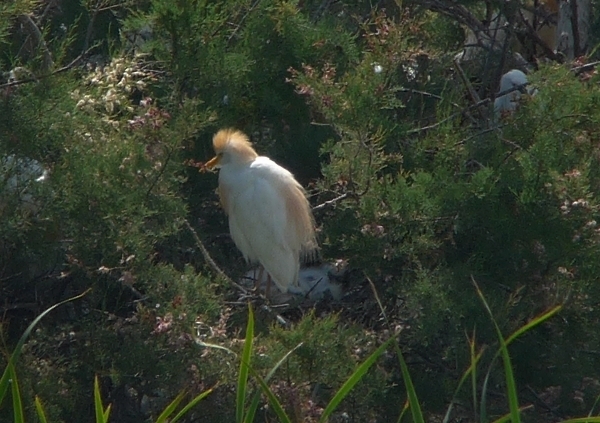 It is a holiday weekend in Spain, but we managed to see the huge colony of breeding egrets and herons. 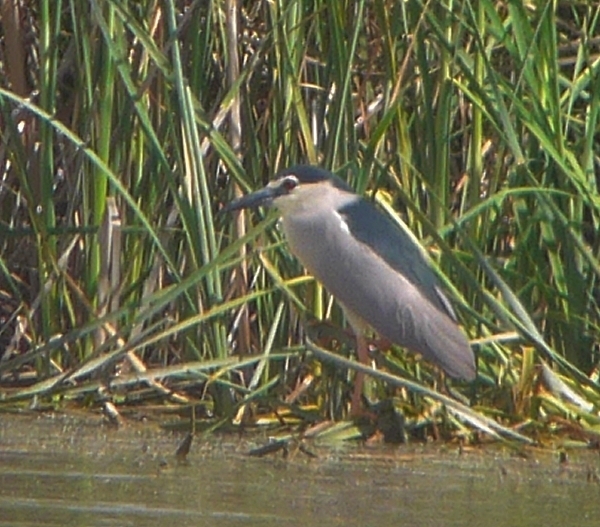 There were hundreds of Glossy Ibis with Night Herons, Squacco Herons, Purple Herons, Cattle and Little Egrets, the noise coming from the colony was deafening. In the pools and surrounding fields we saw a lot more birds, over 100 Whiskered Terns fed over the nearby marsh, a flock of 15 Ravens walked in the fields, perhaps this was the reason why there were no Collared Pratincoles? A small pool of water attracted several species to drink, we saw our only Lesser Short-toed Lark there with White Wagtail, Short-toed Lark and juvenile Corn Buntings. It was now 5pm and I was 4 hours from home! 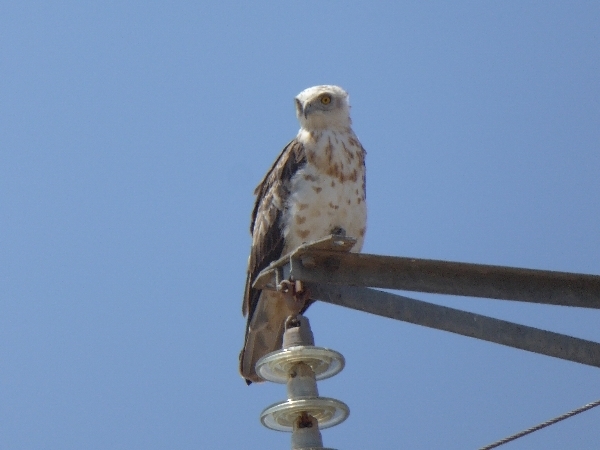 We set off back towards Sevilla stopping to see more birds including Griffon Vultures and a distant Spanish Imperial Eagle and our one and only Marsh Harrier. We also stopped to look at Azure-winged Magpies at a pine wood near Villamonrique, a Eurasian Hoopoe flew over us whilst we were there. We got back to the centre of Sevilla at 7pm where I said goodbye to James and then I set off for Gaucin, I arrived at 9pm, I missed dinner and I was very tired. Shoot me if I ever consider doing this day trip again! !